Moto3 set out first in Malaysia to kick off qualifying in Sepang and were greeted by a drying track. Luis Salom returned to the kind of form which had lead to him leading the championship and set a new qualifying record to take pole, his third of the season. The tricky conditions lead to an unpredictable session allowing some different riders to show their skills and shine through. 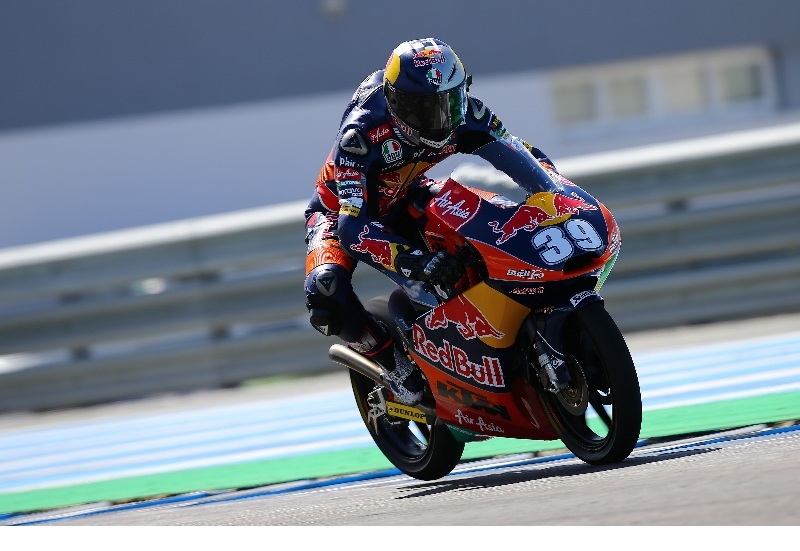 The Red Bull KTM Ajo rider is joined on the front row by the Hondas of Alexis Masbou, a best ever grid position for the Frenchman in second, and Niccolo Antonelli who equals his previous best qualifying performance in third for Gresini. Mahindra’s Miguel Oliveira starts fourth after gaining a tow from an annoyed Alex Rins, who could only manage sixth for Estrella Galicia. He is beaten by one position by his rookie team-mate Alex Marquez in fifth who was chasing Antonelli around the track as he set his best lap. Jack Miller also got in on the towing action and shadowing pole man Salom propelled him to seventh. Next quickest in eighth was the second Mahindra of Efren Vazquez, ahead of Maverick Vinales in ninth, the first time the Team Calvo title hopeful has qualified off the front two rows all season. Jonas Folger rounded out the top ten qualifiers for Aspar just weeks after breaking his ankle. Zulfahmi Khairuddin will need to have another race where he tears through the pack after settling for 14thon the grid. The Malaysian had titanium screws placed in his wrist after the Aragon GP to allow him to compete in Sepang for his home crowd. Brit John Mcphee starts from 22ndon the grid. Moto2 saw a battle for the quickest time unfold between Tito Rabat and Tom Luthi, with the Pons rider coming out on top by a very small margin. Interwetten’s Luthi held on to second as Rabat’s team-mate Espargaro picked up his pace in the latter stages to complete the front row in third. Echoing the events of Aragon, Redding once again struggled in qualifying, posting his best laps late on but could still only push his way up to tenth, almost a second off the pace of Rabat, so will be looking for another great performance come race day to keep up the damage limitation to his championship lead, currently at 20 points. Also inside the top ten were Johann Zarco in fourth after tracking Rabat around the circuit and Mika Kallio in fifth for Marc VDS. Sixth went to Taka Nakagami who only dropped a few positions on the timesheets when both he and his Italtrans team-mate Julian Simon crashed moments after each other half way through the session. Simon starts 17th after neither were able to rejoin. Last years race winner Alex De Angelis will no doubt be in the hunt from seventh. Eighth on the grid went to Xavier Simeon ahead of Aspar’s Jordi Torres in ninth. Hafizh Syahrin has his third wild-card entry of the year for his home race and qualified 18th. Last year he sent the crowd wild by leading the race an finished fourth, so is one to watch. Danny Kent starts from 16thon the grid for Tech3. Fellow Brit Gino Rea is in 25th for the first of his replacement rides, he is in for the injured Alberto Moncayo. Previous Previous post: Marquez ‘really happy’ with pole: "I set a time that I really wasn’t expecting"
Next Next post: Rossi feeling confident with front row start "I can really push and have a good pace"